So I picked up the new Civilization board game from FFG this week. Popped it open, smelled the new box smell, tweeted a bunch of pictures, and organized its contents in preparation for my first play this weekend. Then I dove into the rule book. I like what I see so far, but I've discovered a layer of military abstraction that people may or may not like. I think it's very interesting, but it will be hard to judge until actually played. There are two elements to your military power: Armies and Units. Armies are the little plastic flag pieces which move around the board. These represent where you can project military might. 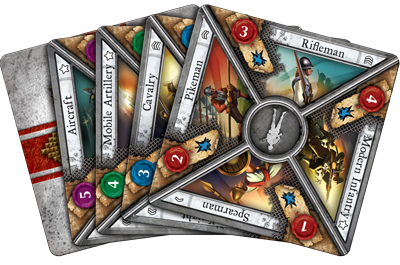 As the game progresses you can build more army figure flags to send out into the world and/or you can build more unit cards to add to your standing forces deck. Now for the abstraction: Units are not tied to a specific army figure flag. Whenever there is a battle, be it because your little flag moved into a barbarian village, or because another player is invading your city, you'll resolve the conflict with cards from your standing forces deck. So, you'll not need to worry about which units are in the field vs which units are guarding specific cities. Your standing forces deck is always there to handle any battle anywhere in the world. Be it at your home capitol or far away invading another land. This may seem weird to folks coming from miniature war games or the PC game. On the other hand this might do a good job of modeling the challenges facing a nation trying to manage a war on multiple fronts. When you take losses in battle unit cards from your standing forces deck are lost. The result is that if your army flag does invade an enemy city but suffers heavy losses, your overall military might has dropped. And therefore your cities back at home are less well defended because your shared pool of standing forces unit cards has dropped. 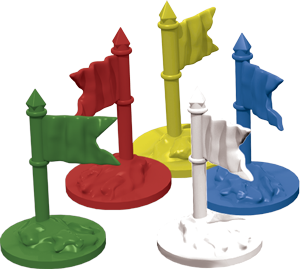 So, when a player has a good standing forces deck and multiple army flags all over the table he will look very scary, as that standing forces deck can project awesome power equally to any of his flags or cities in offense or defense. However as soon as he starts fighting and taking losses suddenly all his flags and cities weaken equally. Actually, when you think about it...that's kinda how the US military works today and one of the big fears people discuss when they talk about how many 'wars' we are fighting. It just may seem weird in the early stages of the game when everyone has spear men and archers.